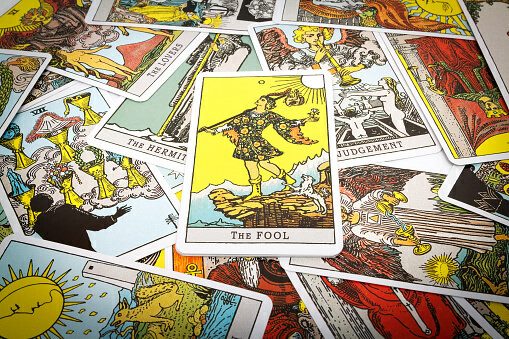 In tarot, the Major Arcana cards represent archetypes—beginning with the inquisitive, risk-taking Fool, and ending with the triumph of the World. 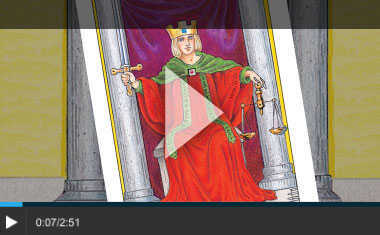 Are you a traditionalist and leader, like the Hierophant? Or a mysterious feminist witch, like The High Priestess? 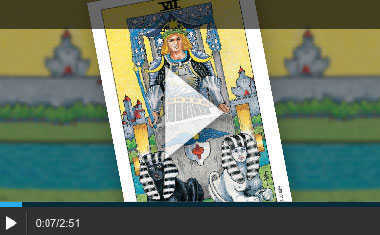 Learn how your personality aligns with the Major Arcana. The people who witness your abilities may perceive it to be actual magic, but it is simply the result of you cultivating your interests and obsessions to the point that you are able to make them happen. You represent focus, concentration, and sensibility, and pragmatism. When you approach a task with purity of heart and an eye for what’s possible the result is nothing short of, well, magic. The High Priestess is mysterious, powerful, radical feminist witch. 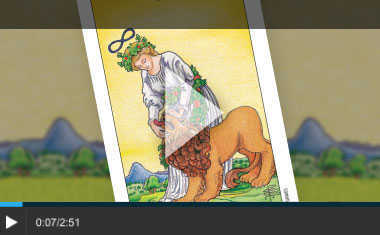 Ruler of the subconscious realm, she represents soliary magic and has a deep knowledge of the psyche. Often you are the one to shed light on a situation and share knowledge that will change people’s minds or enrich a situation. Go figure. 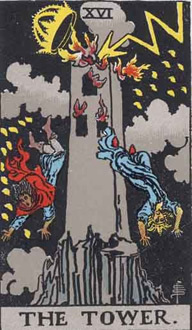 My favorite tarot card is the Hanged man. The result from the quiz ended up being that one. My own interpretation of the card: a mystery whose placid smile is almost like a wink. Last edited by Aramas; 12-14-2017 at 10:10 AM. Sweet, peaceful, and balanced, you are the Middle Path embodied. 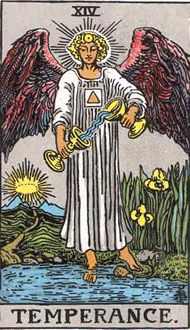 With one foot grounded on rational terra firma and the other dipped in the waters of the subconscious, intuitive Temperance walks in perfect balance; others no doubt find you soothing to be around and wish they could harness some of your serenity. In a time of wild extremes, your balance is truly radical. 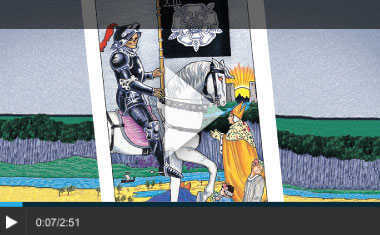 Image: Illustrations from Modern Tarot, by Amanda Verwey. If you chose the cave make some room for my crystal ball and raven. Sounds like Game of Thrones, haha. 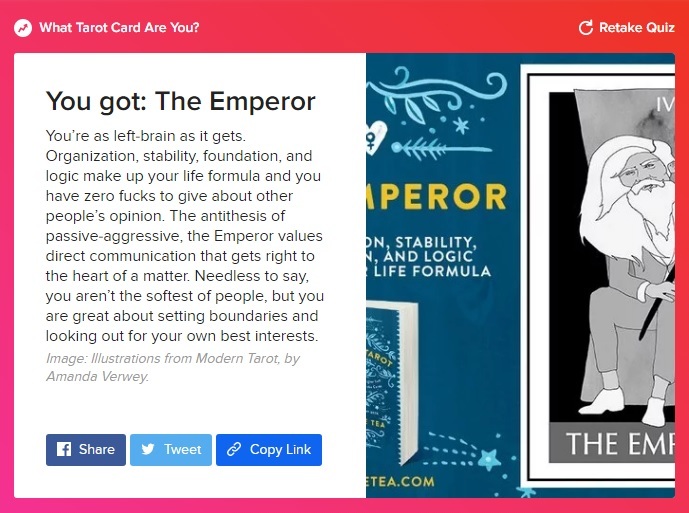 ^ I didn't like my results, either. You’re as left-brain as it gets. Organization, stability, foundation, and logic make up your life formula and you have zero fucks to give about other people’s opinion. The antithesis of passive-aggressive, the Emperor values direct communication that gets right to the heart of a matter. Needless to say, you aren’t the softest of people, but you are great about setting boundaries and looking out for your own best interests. 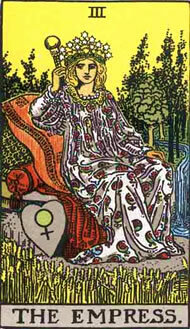 Connectedness is the core of the Empress, the archetypal earth mother. She connects with others deeply and her relationships with friends, family, pets–even strangers—are profound and fulfilling. Often found in an earthy natural setting, your number one connection is with the earth, its creatures, its cycles, and yourself. You are prone to view all of your endeavors through a creative lens, and lack the guilt, shame and toxic perfectionism that can stifle others. 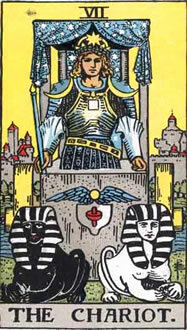 I am Death, Tower/Chariot, The Lovers or Magician, depending on which system I use. 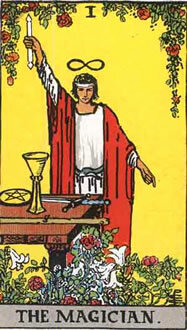 This system doesn't use all the major arcana since there are only the 12 signs. Ruled by Pluto, the lord of the underworld, this sign is a bit of a detective, known for digging deep to reveal what's below the surface. Scorpios are intuitive and emotionally intense. But with a poisonous stinger for a tail, you'd better think twice before crossing them because a wounded Scorpio doesn't forget! So it looks like this card has a skeleton on a horse, and a dead man on the ground -- but it's really not as bad as it looks. 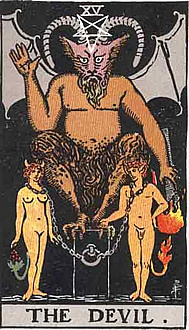 Symbolizing release and rebirth, the Death card is about transformation and reminds us that you must be willing to let go of the past in order to embrace new opportunities. The skeleton actually represents what will remain AFTER death. And his armor reminds us to focus on what is invincible and cannot be destroyed. Just like Scorpio, this symbolism challenges us to look beyond death as we know it and focus on our capacity to rise above our pain and re-invent ourselves. The beautiful white horse that the skeleton sits upon stands for purity. 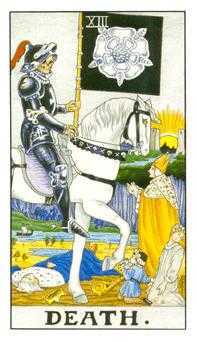 White is cleansing and means rebirth, unlike the black banner that represents the absence of light. The white rose on the flag suggests beauty, purification and immortality. Again, all of this is hinting at Scorpio's amazing ability to transform pain into love. Let's examine the other characters in this scene: The pleading bishop is trying to use his faith to get a free pass, but unfortunately religion carries no weight with death. The woman turning away (in the corner) represents the aversion that humanity has to death -- she won't even look him in the eye and refuses to acknowledge his existence! The child represents innocence, acceptance and a lack of fear, while the dead king is symbolic of the fact that no matter how powerful you are -- death is the great equalizer. 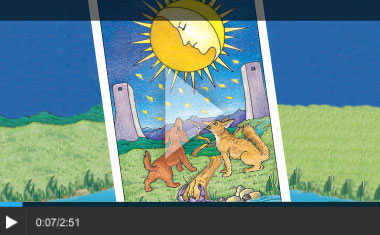 Check out other Astrology/Tarot connections! 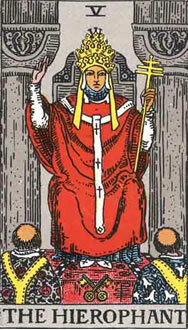 A wise and practiced leader, the Hierophant represents traditions, groups, and situations that require adherence to the rules for the greater good: religions, learning institutions, and clubs of all kinds. 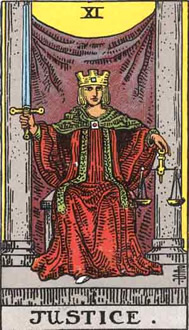 The Hierophant can be of service to humanity, but she does not welcome change. She stands for systems that have been in place for a very, very long time, and lives with a reverence for the way things have traditionally been done. Others might find you stodgy, but embrace your old-fashioned leanings – they will take you far. I got Hierophant as well. You are young, inexperienced, and just brimming with potential, optimism, and spontaneity. 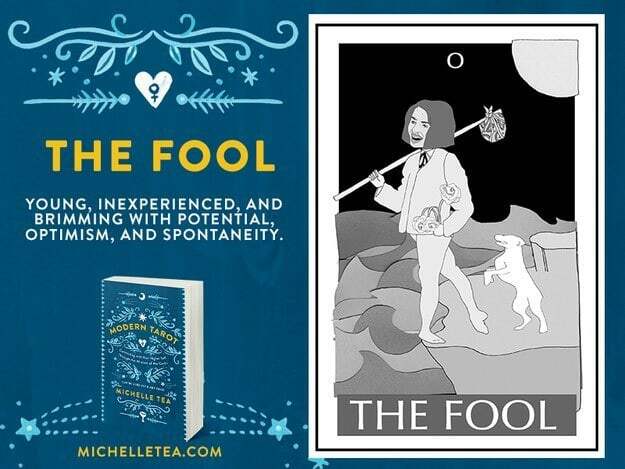 Prone to taking wild leaps, The Fool will experience it all—the highest of love and money, career and intellect, and the lowest lows of despair and destitution, loneliness and devastation—with every leap. Not all of your leaps will be successful. You will definitely fall and may even fall hard, but after experiencing your first success, you’ll realize crazy choices are actually the right ones for you. This is usually something I'd like to give big fat NO (these things are yucky IEI-LII axis things). I do this one for Santa. I got The Fool! 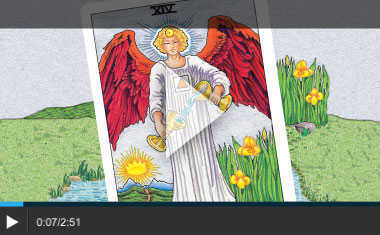 What Tarot Card Are You? One thing is super-duper clear: You are alone. Being alone can be heartbreaking and scary, but it is also simply a part of life. 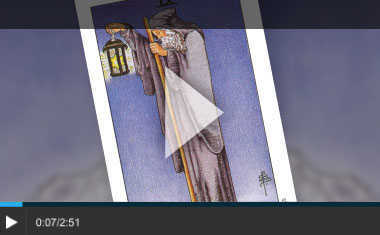 The Hermit card represents the deep and deeply important things we gain from our time alone. The wizened Hermit does not get FOMO. She understands that sometimes you’ve got to get away if you’re going to accomplish something meaningful. Soul-searching is in order, and you will not find the answer in a relationship, or plugged in to social media. You alone have what you need to achieve your breakthrough. Look at you so chill as you hang by the ankle in your tights and a tunic. Is this some sort of ancient yoga move, or perhaps a sadomasochistic ritual of yore? Well, yes. Sort of. 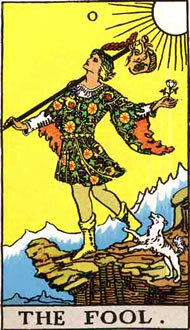 The Hanged Man has put himself somewhere on the spectrum between slight discomfort and deep pain, deliberately, in order to reap the reward of a new and improved reality. Your flexibility, serenity, and patience will reward you in your pursuits. The High Priestess is mysterious, powerful, radical feminist witch. 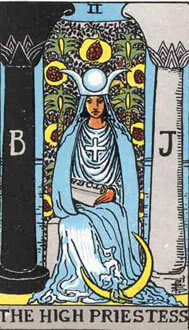 Ruler of the subconscious realm, she represents solitary magic and has a deep knowledge of the psyche. Often you are the one to shed light on a situation and share knowledge that will change people’s minds or enrich a situation. Not bad, except I am not a radical feminist. One is using birth name whilst the other uses a mixture of birth and chosen. 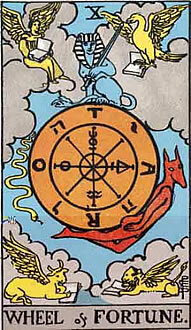 Has anyone else tried to connect the 16 court cards to the 16 Socionics types. Savchenko. then Astalskaya/Plaksina (2) used his work. 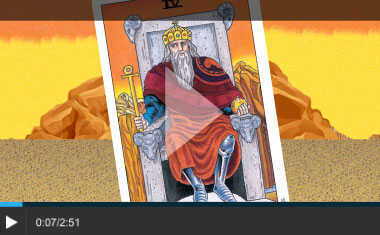 Check the other Tarot thread. Last edited by Sol; 03-22-2018 at 09:58 AM. Here’s a new quiz since the one Sol linked is dead. It gave me the Moon. You are the Hermit! You need to know what makes things tick. You spend a lot of time in your head seeking answers. You're hungry for knowledge and have a need to understand. You can't just dismiss things; you have to know the whys and hows. You'll keep looking until you find the answers, until you find the truth. The more you learn, the more you grow, and you're not afraid to change your beliefs or your philosophies or your goals to adapt to the new information that you uncover. Material wealth isn't as important to you as spiritual wealth. You are more concerned with growing your soul than growing your bank balance. That's not to say you're goal is to be a pauper! No, you'd just rather spend your time reading and researching and learning. You'd rather spend your money on experiences than things. You don't need to be with people all of the time. You're not standoffish or withdrawn, but you do appreciate solitude and the time that you spend in your own company. Of course, you've got your challenges, just like everyone else. Sometimes you don't take enough time on your own to do your meditation and spiritual practice; sometimes you take too much, and it interferes with your family and social obligations. 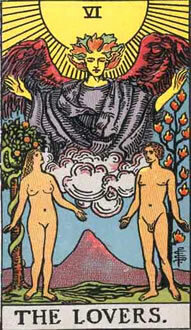 You can get too far out there when it comes to your mystical pursuits, and that works against you in the long run. You have to always strive to find the balance between being with others and honouring your time alone, and when areas of your life start to put pressure on you, it can create anxiety and frustration until you find a way to balance them. You're the Moon! 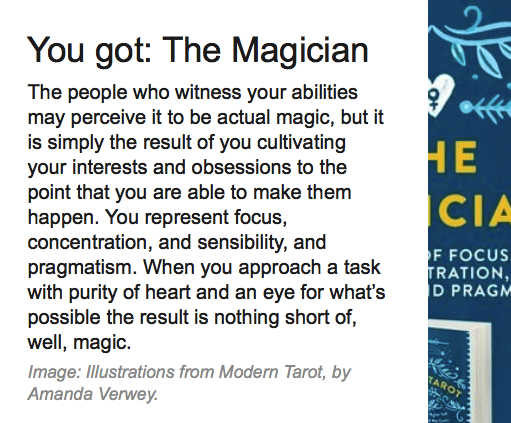 You're intuitive, moody, and probably more than a bit psychic. You sense things before they happen, and your emotions ebb and flow according to your surroundings and the people you're with at the time. Sometimes the intensity of your emotions or the depth of your insight frightens you. You know what you feel, but you don't always know why you feel it, and that can make you twitchy and nervous about what's yet to come. You're also one of the first to sense when things aren't what they should be. You can usually tell if someone's troubled or unwell - even strangers. You sense changes in the weather, and you have precognitive dreams. You'll be thinking about a loved one and they'll phone. You've got such a strong inner light guiding you forward, but you don't always trust it. When you step out in faith, you'll learn a lot about the metaphysical world and about your own soul's journey. When you're feeling out of sorts, your apprehensions get the better of you. You're suspicious of people-often unnecessarily. You allow yourself to be confused and overwhelmed by all the feelings and emotions that are coming at you. You imagine all kinds of drama and crises in your head, and usually these are unfounded. When you feel powerless, like everyone wants a piece of you, it's a sure sign that you need to retreat into your own company for a bit. Writing out your thoughts in a personal journal or blog and meditation will soon get you balanced again. Last edited by Aylen; 02-06-2019 at 11:22 PM. I also got The Hermit. I got Temperance. I wanted The World. Doesn't everyone want The World? What else could you want?